I've decided to participate in a challenge. 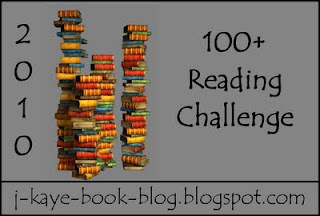 I've never done a reading challenge before, but one of my personal goals this year is to read 100+ books in 2010. So why not join the 100+ Reading Challenge 2010? Here I go! Thanks for this - have signed up! I know you can do it Mar! Have fun! Have you seen Heidi's and my challenge? It might help you get to your 100 books. I love challenges...if you couldn't tell. Have fun!! And good luck! It's funny since this year I am only letting myself read one book per month. Last year I read over 100, and this year I'm making myself slow down. How funny is that?? I'm participating in this one, too, and hope I can finally make it to 100 books read in one year! Last year I stopped at 89. Yikes. Good luck!